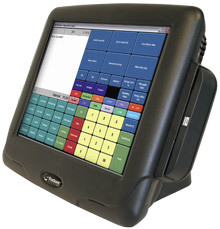 With its large, 15" display, the NCR Quest Q1515 touch screen POS terminal has been specifically designed for premium, high traffic service areas that require an easy-to-use yet powerful device. The Q1515 is a robust, purpose-built, and highly secure station designed around a durable touch-screen display. With its fanless cooling technology and rugged design, the Q1515 can be placed wherever the environment demands.